Cotswold Wildlife Park was criticised on social media after the three-year-old female animal, named Ember, was killed on 21 July. It was found outside the perimeter fence and the park's managing director said staff were too far away to tranquilise the Eurasian wolf. Police said park staff have reported threatening voicemails and emails. A Thames Valley Police spokesman added: "Officers are investigating the circumstances and the local neighbourhood team has been in contact with the park to provide safety advice to staff. "Uniformed patrols will be taking place in the area as part of the investigation, and to provide reassurance." A park spokesperson said: "Our priority now is to safeguard our staff and visitors, animals and park." Visitors to the park were told to stay indoors when the wolf was discovered outside the park heading towards the A361 at about 11:00 BST. Managing director Reggie Heyworth said the charge on the electric fence was not at the level it should have been and said it was possible she climbed over the barrier. He said staff were "devastated" by Ember's death and added: "At no time were members of the public in any danger as the wolf was away from the visitor area throughout." Ember and two-year-old male wolf Ash arrived at Cotswold Wildlife Park, near Burford, Oxfordshire, from Sweden in October as part of a breeding programme. 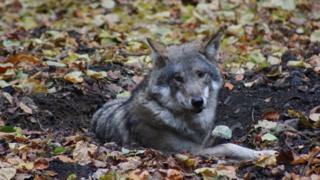 Earlier this year she gave birth to five cubs, the first wolves to be born at the park in its 47-year history.